Why is Your Brother MFC J485DW’s Ink So Damn Expensive—and How Can You Avoid It? Joy March 13, 2019 March 18, 2019 No Comments on Why is Your Brother MFC J485DW’s Ink So Damn Expensive—and How Can You Avoid It? If your office has yet to go paperless, you’ve probably found that printer ink is one of the most expensive additions to your monthly expense report. Many shoppers are convinced that purchasing a cheap inkjet printer and stocking up on official ink cartridge replacements is the most profitable choice when in reality, nothing could be further from the truth. Many big name brands that manufacture printers intentionally put their products on sale during peak times of the year, such as Black Friday, but knowingly mark up the prices of their ink cartridges—many of which yield a significantly low amount of ink before you need to replace them. It’s an old marketing tactic used by razor manufacturers, too: sell one product for a relatively inexpensive price and then build up a profit margin on the replacements. You may never need to buy another inkjet printer again as long as you live, but manufacturers can guarantee that you will be in need of replacements on a regular basis. For that reason, they intentionally make it simple for you to buy a printer outright, knowing that you will be a customer for life as long as you need to continue replacing cartridges. Most printer manufacturers actually lose money on the printers themselves, but they make lots of money on the ink replacements. Unfortunately, printer ink is a resource that you will continuously need to keep replacing as long as you print documents or high-definition glossy images. Printer manufacturers know this, which is why they sell their replacement ink at exorbitant prices. As long as you continue to utilize your printer in an office or school setting, one way that you can avoid paying ridiculously high costs for ink cartridges is by buying cheap compatible ink from a third-party manufacturer. Retailers such as 123Ink.ca sell compatible ink for products such as the Brother LC203 Ink at a significantly lower cost. Unless you are capable of going completely paperless at your place of work, you will find ink replacement to be a necessary evil. The best way to cut back on the expense is by purchasing from either a brick-and-mortar or online retailer that sells marked-down compatible ink for your Brother MFC J485DW. 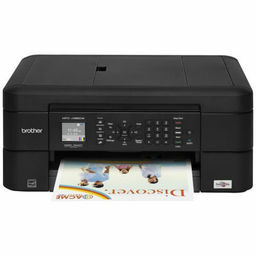 Does Your Brother MFC 480DW Printer Leave an Invisible Tracking Code on Your Printed Document?